This is another guest post by Taylor Woolston... another Winnipeg railfanning tour by bicycle! 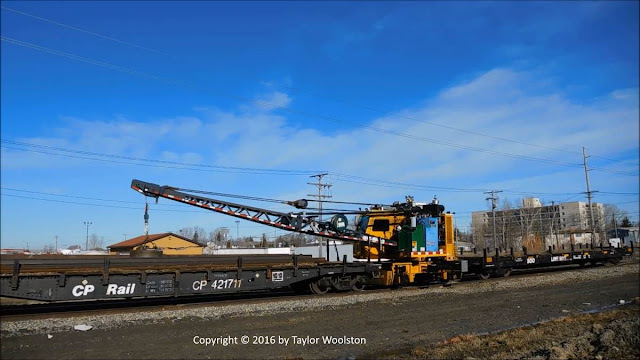 On Wednesday March 30th, 2016, it was the third day of Spring Break, and I decided that I would go and railfan the BNSF Manitoba Railway for a bit. BNSF Manitoba is a is a shortline that owns a few miles of tracks in Winnipeg. They bring cars to and from CP's Westview Yard at "Garbage Hill", and CN's Fort Rouge Yard, and they also serve a few industries, including ADM, which is right beside their engine house. They usually start their operations at around 10 AM. After waking up and having breakfast, I packed up my equipment and rode off on my bike towards the BNSF. Being around an hour early, I decided to make a stop at St James Junction, which is a short hop from the BNSF. Here, the CN Rivers Subdivision crosses the CP La Rivere Subdivision. When I got to the junction, I noticed something north of the diamond on the La Riviere Subdivision, but I couldn't figure out what it was; however, it was coming my way. Before it could cross, it had to wait for a couple of CN trains to cross the diamond. Right after the second CN train crossed, the thing on the CP La Riviere Subdivision crossed over, heading south. 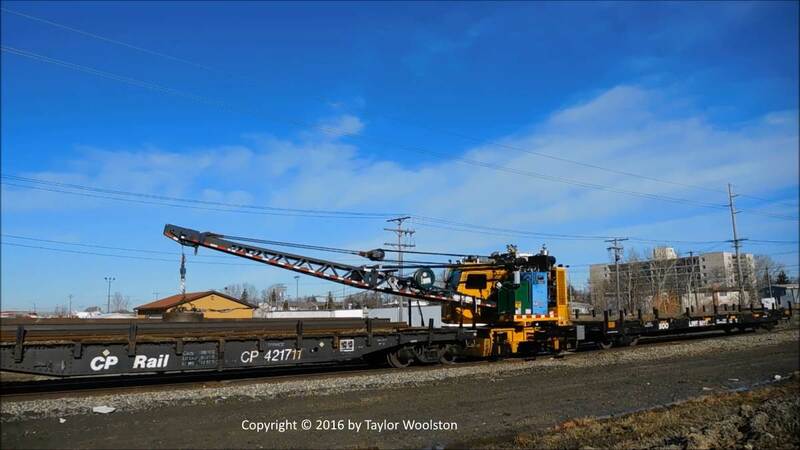 It turns out it was some kind of self-propelled rail crane, with a couple of flatbeds surrounding it, CP in front and SOO behind. Once it passed by, I made my way over to Grant Avenue to get set up for BNSF. As I rode past the ADM area, I noticed that they were already active, moving tanks around. I got to Grant Avenue, set up, and waited. Then I noticed something to the north, there was a CP train coming! As CP came closer and closer, and the BNSF was finishing up and getting ready to go, I wondered which one would pass by first. 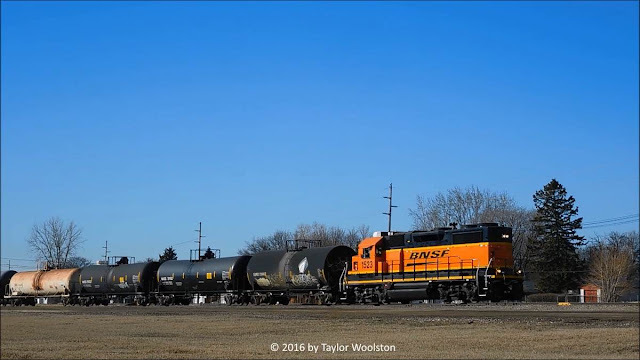 In the end, BNSF passed by first with BNSF 1523 (GP28-2) and 7 tanks in tow. 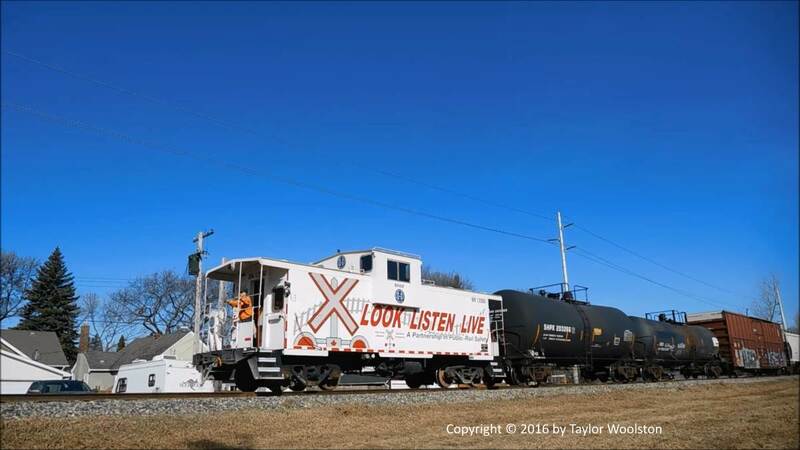 I was very relieved to see that their caboose, BN 12580, was on the tail end to "complete" the train. The BNSF freight met the CP train a little bit north of here, and just a few minutes later, CP passed by with CP 2304 and 2211 (both GP20C-ECO's) hauling a relatively long train south. This was most likely the train that goes to the Altona, MB area. Once it finally passed, I packed up and biked north. I crossed the combined rail and foot bridge (which is very useful, and you can get very close to the action!) across the Assiniboine River, looking for a spot to try. After a few minutes, I realized that the BNSF was approaching! I decided to bike back across the bridge, and set up near Wellington Crescent. A couple minutes later, they came into view with the caboose leading mostly tanks heading south. Immediately after they passed, I packed up and gave chase, which is not easy on a bike! Slowly, bit by bit, I passed them, and I was able to beat them to Taylor Avenue. I noticed that their signal onto the CN Rivers Subdivision showed Slow-to-Stop (Red over Flashing Yellow), which indicated that they would probably be stopping at Waverley Street, so I gave chase again. Sure enough, BNSF stopped short of Waverley Street. After a little while, a westbound CN train roared past. Once that train passed, BNSF got clearance to Fort Rouge Yard, and they passed by. After that, I decided to head back north to Wellington Crescent and look around for a shot there. After waiting for awhile for BNSF to return, I could hear some horn blowing coming from the north. It sounded like it was coming from the St James Industrial area. After thinking for a bit, I decided to take a risk and abandon the BNSF, and ride up north to see if there was anything going on. I went up to Saskatchewan Avenue, which parallels a CP spur that serves a few industries. There is also the ex-CN Oak Point Subdivision, which CP uses a few miles of to serve a few industries. Most of the CN Oak Point Subdivision was abandoned in 1996, but a few miles in the city survived, which CP now uses as a spur. I didn't see anything at all going on, then I noticed that the switch that leads to the Oak Point was set to go to the former branch line. With the track layout, I knew instantly that there must be something up there! I rode up a few streets, until reaching the area where King Edward Street (Route 90) crosses under Oak Point and the CP Carberry Subdivision. From there, I was able to see a CP locomotive doing some switching near Brookside Blvd, which is where the track ends. After awhile, they appeared to be done switching and were heading away from the industries, so I decided to ride away and set up somewhere. While coming up here, I noticed a small wooden bridge where the track crosses over Omands Creek and I decided that I would set up there. When I arrived, they were in view, but still a fair distance away from me. Eventually, they very slowly passed me with CP 4428 (GP38-2) pulling 3 cars at around 5 MPH. When they passed, I immediately packed up and chased them back to Saskatchewan Ave, where a curve takes them off the Oak Point Spur, and back onto CP's main lead for the area. The CP crew stopped before coming around the curve, which helped allow me to get set up again. After a couple minutes, they came around the curve. Once they came off, they threw the switch back and pushed the cars back towards a siding. Afterwards, I decided to head home. I rode south down Empress Street, when I heard a train horn. From the north. You might think it was just the local freight I just saw, but the horn was completely different, it was a horn only used on GP20C-ECO's. At Omands Creek, I took a look, and sure enough a train was coming south on the CP La Riviere Subdivision. 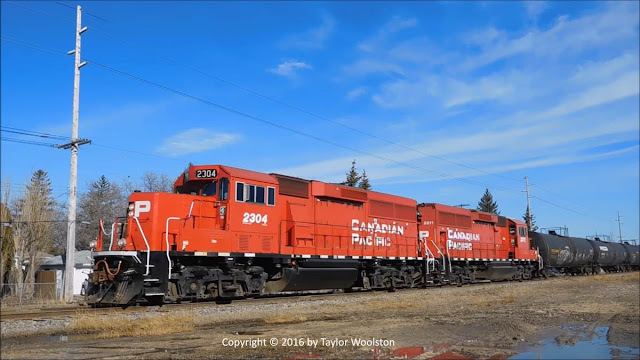 I setup on a nearby foot bridge, and captured CP 2317 (GP20C-ECO) and 3068 (GP38-2) leading a local made up of hoppers and a few tanks. That was the end of a great day of railfanning, made up of lots of branchline action, some caboose action, and even a little mainline action! Thanks for the guest post, Taylor! You can see Taylor's other guest post here and please go visit his YouTube channel.